Leanne joins her son, Connor Page, to create an especially enchanting atmosphere. To the beauty of the harp and voice are added the sensitive sounds of the classical guitar, the merry and haunting piping of assorted winds and fipple flutes, and the versatility of the piano. Leanne and Connor's collaboration always produces a melodious and unique musical offering. 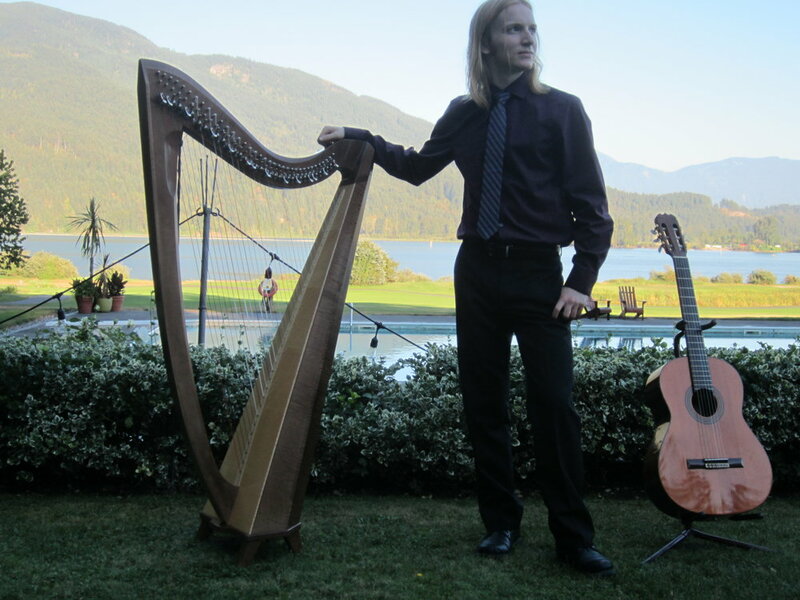 Connor is currently studying music at the University of British Columbia, and he enjoys bringing a multi-instrumental flair to a wide variety of styles, ranging from early music to Celtic to jazz. Since his early studies in classical piano Connor has broadened his musical skills and interests to include a variety of fields and idioms from continuo playing to jazz and folk song repertoire, all of which contribute to his love of music as a multi-faceted art form. His activities have ranged from choral accompaniment, community and university concerts to private and corporate functions. Connor’s musicianship finds inspiration and enrichment in his academic pursuits, which extend to the areas of language, literature and music history. Connor is currently involved in keyboard, choral, and early music projects at UBC, and has had the especial pleasure of working alongside skilled and insightful members of the Pacific Baroque Orchestra in the context of UBC early music ensembles. Recent events include UBC concerts A Festival of Baroque Chamber Music, A Tribute to Telemann and the St. John Passion, the Cathedral Summer Festival of Sacred Music at Christ Church Cathedral. and The Bach Project III at St. Phillip's Anglican Church. Particularly special to him, though, is the chance to complement his mother's beautiful harp and voice with his array of guitars and whistles. Leanne and Connor look forward to adding the magic of live music to your special occasion. For video samples and testimonials of Leanne and Connor's Celtic Harp Duo please visit Harpist for Hire or Repertoire.